Any other planner freaks out there? Her planners are beautiful but I also just love her little soul-prompts to help spark creativity. She's spiritual and I like her way of doing spirit! Great thread idea! I love using my planner also. Like you, Medusa, I love the ones with words of inspiration, quotes, etc. I haven't seen them in a very long time, but I used to get those boxed cube calendars with sayings on them...I loved the quotes of the day especially! The coolest planner I can imagine would be one with Maya Angelou's words of wisdom as I really admire her most!! I have a planner with me everyday when I go to work...I enjoy planning my week out and trying to stay ahead of things like birthdays and anniversaries...important dates, etc. I am currently making a planner (bought at Michael's, a blank one where you write in the months, days, etc.) for my best friend for her 50th birthday. It will have all her important dates in it, plus some inspirational quotes, fun stickers, and extra stickers for her to put in as she makes doctor/dentist appointments and other kinds of plans. This ties into the writing instrument I use as well sometimes...a nice pen or marker, sometimes a mechanical pencil for tentative plans. I've had so much fun making my friend's planner I've decided to make one for myself. It's nice if it happens to come with a pocket, if it doesn't I make one on the inside of the back cover to be able to put a supply of postage stamps in it. Omg, I thought I was the only one that did that! I have a small(ish) notebook that I use daily for documentation, logging info, notes and just personal organization. When you go to the site you can build your planner from a variety of options, features and sizes. You choose the front cover art, monogram, script, etc. There are 12-18 month planners, student layouts, traditional layouts, monochromatic tabs, color tabs, the choices really do seem endless. They have layouts for party planning, health/fitness goals, several custom add-in pages (budget, project, wedding or baby planning, etc.) They have folder pockets, stickers and yes it is all round spiral so can be opened to fold flat. I like it because I can design just what I want and not have extra pages getting in my way. My daughter liked mine so much she now uses one because high school is no joke. Those kids are crazy busy! My Desire Map weekly planner came today and it is so gorgeous. It’s exactly what I was looking for! Gorgeous and sleek! 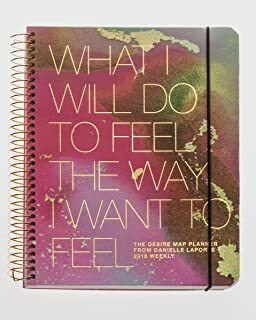 This sounds almost good enough to make me try a different planner! I love the idea of being able to design exactly what you want. I also always peel off about 20 sticky notes from a pad and stick them in the back of my planner. The Super Sticky ones work best. I love the idea of a pocket for my stamps! i found a new one that is all that I need in one piece! ... is that what I had to do to get a kiss from you? When I started going to school full-time last year, Logicaly bought me a planner I had been eyeing. His sister, who went to school for the military FT while also working, often used one and loved hers. I love to make lists, use sticky-notes often at work, etc. I don't have an issue remembering, but I like to view tasks to be done and prioritize because it makes me feel GOOD. So, I used my planner for the year I went full-time, and it has been sitting aside these last six months. I bought a work-out pack to swap from school to health before the summer started but never got around to swapping it out. However, now I sit here with a clean, open binder and four months of health-focused pages to plan out and I am EXCITED! I just got this planner that I think will serve me well. We'll see. I've been using some kind of planner since the 90s. I started with Franklin Covey and then just moved on to whatever struck my fancy. This year I started using a basic FRINGE Monthly and Weekly planner. It's okay, but I don't like it as much as the Productivity Planner I just got from Amazon. A coworker recommended the Productivity Planner, so I'll try it out for awhile to see if it's what I like. I am without a planner this year for the first time since probably high school. I use a desk blotter to track my appointments during the work day and use the calendar on my phone to note before and after work planned events. I thought I might hate it but I actually find it more simple. Plus my partner and I are able to share a calendar that way and plug in our dates or times when one of us is out of town/working late/etc. When I told my daughter I wasn't using my paper planner anymore she fell on the ground gasping... "but that's your bible!" hysterical. I am without a planner this year for the first time since probably high school. I use a desk blotter to track my appointments during the work day and use the calendar on my phone to note before and after work planned events. I also took the plunge and switched over to my phone calendar this year. I am trusting it more and more. I still have to have a paper planner though, even though my calendar isn't in it. It's for all the other stuff I write down - stuff I used to put on sticky notes, my check register, bills, addresses, everything. I have a lot less paper in my life since I started keeping everything in the planner. i’m about to start looking for my 2019 planner as I plan to fill it up with lots of bookings! Now that school's revving back up, a new batch of planners and organizational tools have appeared. So happy! I don't like the bulk of a traditional planner but I do like having room to jot down work schedules, notes, payment reminders, etc. I also am keeping a running tab of all expenses in a bank register kind of way but not exactly and it's working much better than my previous method. I have a pocket planner that goes in my purse and a larger one for home. Information gets transferred every couple of days. I feel that I'm on top of it without being compulsive or fanatical. I haven't always had that balance so this is pretty damn cool right now. I almost don't recognize myself! I really like the Productivity Planner from Intelligent Change, but they don't make a digital version. Is anyone using a digital planner? If so, may I get some recommendations? I love having an actual paper planner and am very into it. I use stickers and different colored inks and decorate everything and use stickers specifically made for planners. Right now I have a Creativity 365 Happy Planner in the large version. It's huge and bulky but I don't care, it's my baby. You can get all kinds of add ons and I got the budget packet and the six month add on packet. Plus four books of stickers. I play in it every day. I may be obsessed but it's something creative for me and also keeps me very organized.